The divine dance of Nataraja in the golden hall of consciousness is referred to as ‘Ananda Tandava’, the Cosmic Dance of Bliss. 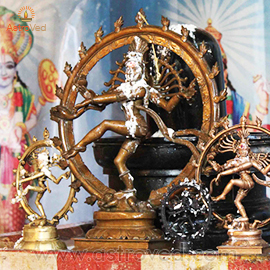 Six times a year, the energy of Nataraja becomes active on the Earth plane. Early winter, late winter, early summer, high summer, during the rainy and autumn seasons (six seasons) which coincides with the dawn, morning, noon, afternoon, evening and night times in heaven. It is important to perform Nataraja Abishekam on these auspicious days to honor and invite this transformational energy of Shiva into our lives. WHY CONNECT WITH SHIVA DURING HYDRATION CEREMONY? Dr. Pillai says that hydration ceremony is the most powerful in making the statue of dancing Shiva come alive by pouring milk, yoghurt, ghee (clarified butter), and orange juice. He also says that it is not a superstition to pour these substances, but that these rituals bring the statue to life- which then has the power to answer your prayers and connect you with higher consciousness. 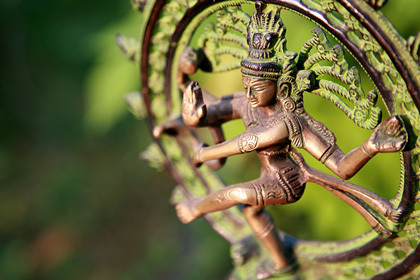 Six times a year, the energy of Nataraja becomes active on the Earth plane. Dr. Pillai says that hydration ceremony is the most powerful in making the statue of dancing Shiva come alive by pouring milk, yoghurt, ghee (clarified butter), and orange juice. The dynamic energy of Nataraja can eradicate old, negative patterns limiting our potential and remove the bad effects of karma. Your sincere prayers and participation in the ceremony doubles the effect of the dissolution of karmas and to strengthen your life with powerful positive energies. You will receive the sacred grey ash powder from the homa and Vibhuti which will be blessed in the rituals. Keep this on your meditation altar and wear it on your forehead during meditation or at other times to expand the Divine blessings into your life.